Does your home currently have old, wood siding? Are you looking to upgrade your exterior? When you need to spruce up your home, consider the many benefits of vinyl siding. Vinyl siding costs significantly less than wood siding, and it tends to last much longer. Because the material is built to withstand the elements, you don’t have to worry about termites, wood rot, or hail damage. Depending on which type of vinyl siding you choose, you could also benefit from improved energy efficiency in your home! 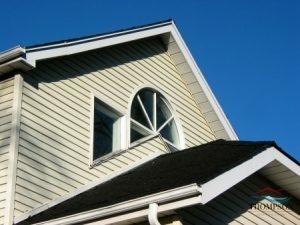 One of the major benefits of vinyl siding is its versatility. Do you want a scalloped design or vertical siding? Do you want a neutral or bold color? Want your home to look like it is covered in cedar shakes? Vinyl siding is available in a nearly overwhelming number of colors, styles, thicknesses, and more. You can even get vinyl siding that looks like wood if you want that classic style. With vinyl siding, there’s no need to seal and treat your siding every so often. It is extremely low maintenance, only requiring an occasional cleaning and inspection. There’s no need to paint your home or worry about pests and rot, either! You can rely on vinyl siding to protect and insulate your home for many years to come. Are you interested in the benefits of vinyl siding for you home? Call (573) 789-8367 for professional vinyl siding installation at the Lake of the Ozarks, MO by Thompson Roofing & Siding! Posted in Uncategorized on February 21, 2017 at 5:31 pm by Thompson Roofing & Reconstruction.